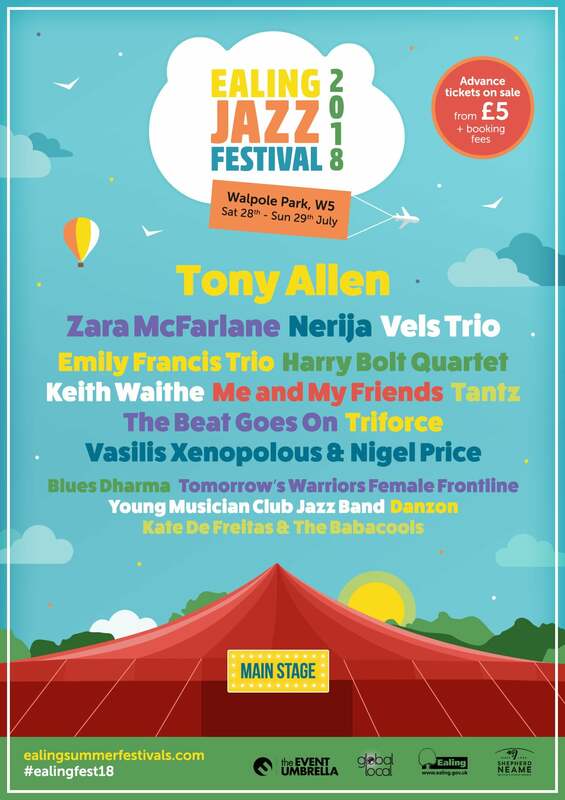 Walpole Park in West London will once again play host to Ealing Jazz Festival in 2018 on the 28th and 29th July, with the great and the good from the jazz world descending on the west London borough for what promises to be a must for the summer calendar. Topping the bill for this years Ealing Jazz Festival is no other than Afrobeat legend Tony Allen, iconic drummer and musical director of Fela Kuti’s band Africa 70, who is revered as a founding member of the Afrobeat genre, and some would regard as one of the greatest drummers of all time. Tony Allen performs after spending his 2017 exploring the inter-woven relationship between African drumming and jazz, releasing earlier in the year an EP ‘A Tribute To Art Blakey And The Jazz Messengers’ – Art Blakey being a drummer in the American jazz scene which Allen attributes as an early influence – and a full length album ‘The Source’. Each of Allen’s 2017 releases holds a mirror up to his influences, creating a sound that straddles the middle ground between Afrobeat and jazz. A sure fire combination to light up the Ealing stage for the night! Other names on the Ealing Jazz Festival line up encompass all of those that are burning brightly on today’s scene. Tony Allen will be joined on stage by Mobo award winning jazz vocalist Zara McFarlane. With three studio albums under her belt, Zara’s sound combines deep soulful vocals with the intricacies of jazz. TriForce – of whom we had the pleasure of catching up with before their show at the Roundhouse Rising Festival for a ‘Culture Talks… TriForce‘ – have grown out of the south London scene and create a unique blend of jazz rhythms fused, frantic guitar licks from Monsur Brown himself, and soulful keys underpinning it all. Furthermore, experimental jazz band Vels Trio will be making an appearance at the festival, as well as the London based jazz collective Nérija. Take a look at the listings below for the full lot of first-wave announcements.